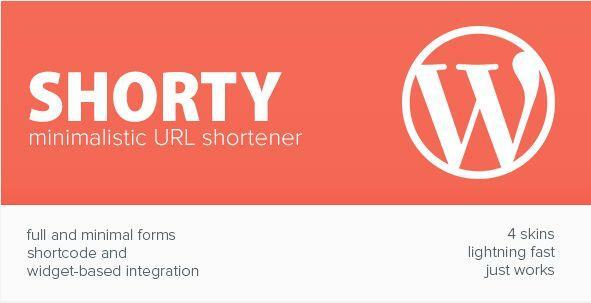 Shorty is a WordPress plugin for creating a minimalistic URL shortener service. Can embed an URL shortener form into pages or posts, including custom post types. Adds an URL shortener to the admin area. You can use a shortcode, PHP API or a widget. 5 styles – Basic, Minimal, Metro, Plastic, Goo. Stores different users’ shortened urls and stats privately. Users don’t need to be logged in to track their shortened URLs. You can use a separate short domain separate from your usual one. Feel free to ask for new features! Custom URLs available from 1.0.2 release. Automatic post URL shortening (domain.com/month/day/postname can become d.com/s3d4). Available from 1.0.2 release. You can redirect users to an advertisement page before showing shortened URLs to earn some cash. Minimal efforts required to do that (changing one option and using a shortcode). Shorty was only released a couple of days ago. I am doing my best to make it flawless, but bugs happen. If you faced one – feel free to ask at the Comments tab or contacting me directly. I mostly respond within the same day and fix problems pretty fast. WordPress 3.1. WordPress 3.3 or above is recommended. Minimum required PHP version is 5.2. IE8+, modern versions of Firefox, Safari, Chrome, Opera supported. Shorty adds an “URL shortener” widget that can shorten current page url and allows to copy it. You can add it to the widgetized area using Appearance -> Widgets section of the admin area. use [short_url] shortcode to show a shortened url for the current page. use to receive a shortened version of any url. Unzip the archive (probably, you have already done that :)). Copy `shorty` directory to wp-content/plugins subdirectory at your wordpress installation. Activate Shorty plugin from the WordPress admin panel by clicking Plugins, then “activate” next to Shorty plugin. The plugin is active! You probably will want to change some settings. Log in as admin (probably you already are). Go to Settings -> Shorty, change what you need to be changed. Feel free to ask for support! Share the post "Shorty URL shortener"